At Cascade Living Retirement Communities you can relax and enjoy yourself while we take care of the day-to-day tasks to make it possible. 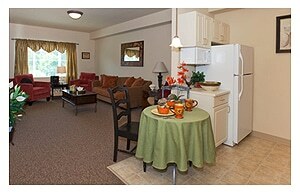 Choose from several spacious floor plans to meet your needs. Most apartment homes have a patio or balcony and all have a full kitchen, including appliances, draperies and individually controlled thermostats for your personal comfort. Many of our residents are active, involved individuals who have traditionally taken part in the local community. Examples include participation in Kitsap County Hospice, local food and clothing banks, the American Cancer Society, Salvation Army and our annual Christmas event, the Angel Tree. At Arbor Village, we offer a lifestyle unlike any other. It’s a wellness-focused lifestyle dedicated to positive aging and well-being that applies to mind, body and soul. It’s a life filled with culture, nature, health and true beauty. It’s a life encouraging individuality, providing residents with the opportunity to define how they want to live. Life at Arbor Village is like vacationing at a luxurious resort – only its home. We have a full-time concierge and Arts and Entertainment Staff to help make sure we’re providing enriching, engaging programs that meet your interests.